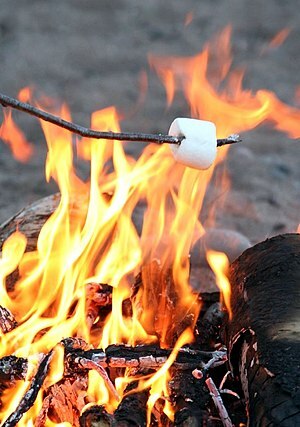 Now-a- days, I’ll gladly eat a S’more if someone else will toast my marshmallow, because I still can’t seem to get it right! That’s probably why I think these bars are so fabulous. There is no toasting of marshmallows involved—what’s used here is marshmallow fluff out of a jar. While it’s a little sticky to spread, I’m better with that than I am with an open fire. Graham crackers, chocolate and marshmallow fluff. 1. Preheat the oven to 350*F. Line an 8 x 8 inch baking pan with parchment paper, leaving an overhang at the sides. 2. In a mixer bowl, beat the butter, sugars, and vanilla together until light and fluffy. 3. In a small bowl, whisk together the flour, graham crumbs, baking powder, cinnamon and salt. Stir into the creamed mixture until well combined. Batter will be crumbly. 4. Spread 2/3 of the batter onto the prepared pan and press into an even layer. Lay the two chocolate bars in an even layer across the dough. 5. Spread the marshmallow fluff over the chocolate, and crumble the remaining dough evenly over the top. All layered up and ready for the oven. 6. Bake until puffed and set, about 25 to 30 minutes. Cool completely. Remove the square from the pan using the paper overhang and place on a cutting board. Cut into 16 squares. So good. After one you will want s’more!